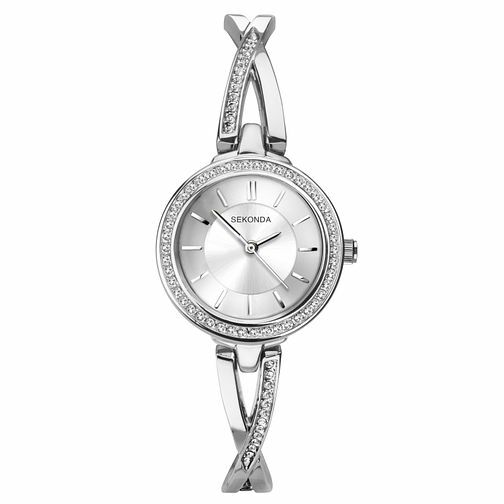 Sekonda have perfected the smart, shimmering and stylish wristwear design with this dazzling timepiece. With a chic silver sunray dial featuring silver tone hands and hour indices, shimmering crystal stones are set upon the bezel for an extra shine. A half bangle alloy bracelet is also embellished with sparkling stones, in a contemporary cross-over design, versatile for both day and evening wear. Sekonda Ladies' Silver Tone Bangle Bracelet Watch is rated 5.0 out of 5 by 2. Rated 5 out of 5 by Anonymous from Beautiful. Looks even nicer in person. Very happy with this purchase. Rated 5 out of 5 by Anonymous from Very nice, exactly what I expected and more Bought this as a Christmas present for my mother, opened it up to have a look and I was surprised at how good quality it was for he price. Very impressed.